How pretty! 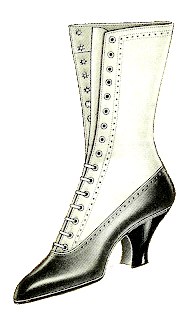 This is a beautiful women's shoe graphic from a 1917 clothes catalog. I love the contrast between black and white and the heel. It must've taken quite a long time to lace up these beauties, but it would've been so worth the effort. 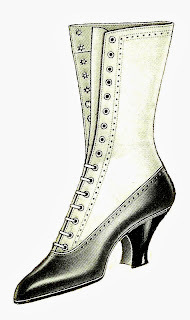 I've given you both the .jpg and .png files of this vintage shoe fashion clip art. I've recently posted another lovely vintage shoe graphic here. Enjoy!